Do you suppose your father’s aim in purchasing the Beatles CD set was to have the sounds of his young family in his living room again? Funny what grows on us while we’re not looking. A touching way to remember your father, Charlie, and one many of us of a certain age can relate to. 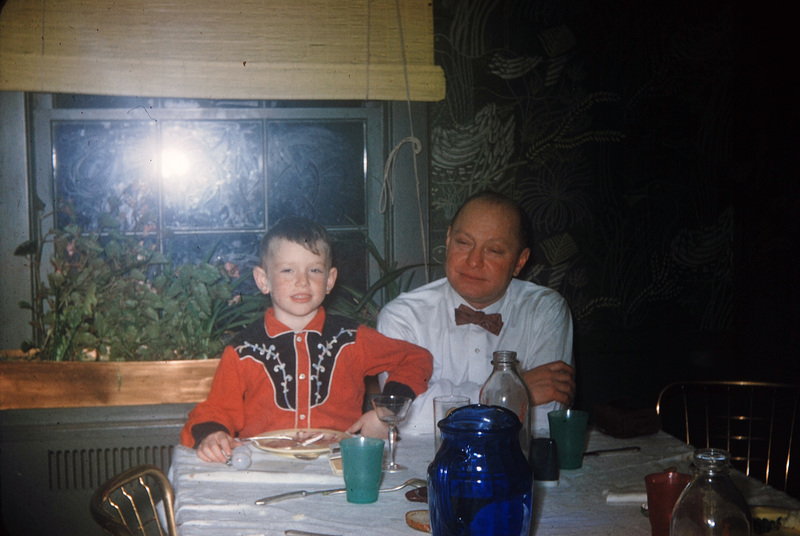 A fitting tribute to the dads who got us started, however reluctantly, on our musical paths. Love makes a man a true father, not merely biology, and I am missing mine as I read your post. Well, Chuck (my father was called Chuck but his name wasn’t Charles) maybe he was trying to recapture his younger, noisier days, but after 9 kids (all boys), he was probably happy for the quiet that resulted from all of us finally leaving home, probably by 1982 or so. I think he actually liked them all along. He had more of a problem with the hair than with the music. I fought him on that until I went college-that’s five or six years of fight-and then didn’t cut my hair for four years which drove him nuts when I was home. Great tribute to your father and equally great pictures, Charlie! We all should be very grateful to our parents! Too bad he never played guitar (or any instrument), as he had no concept of scale length, and, doing everything “by eye”, he was a little off, but close, so up high on the neck its off, and now, a few wonky frets make it unplayable, but it still hangs from the highest peg in my “studio”. A great lead-player friend of mine saw it up there, and insisting to play it, was blow away by the unique funky tone, and that almost all the knobs still worked. Mom especially loved our basement practices (1963?) and both were on board to help me get my Kay 592 “Red Devil”. 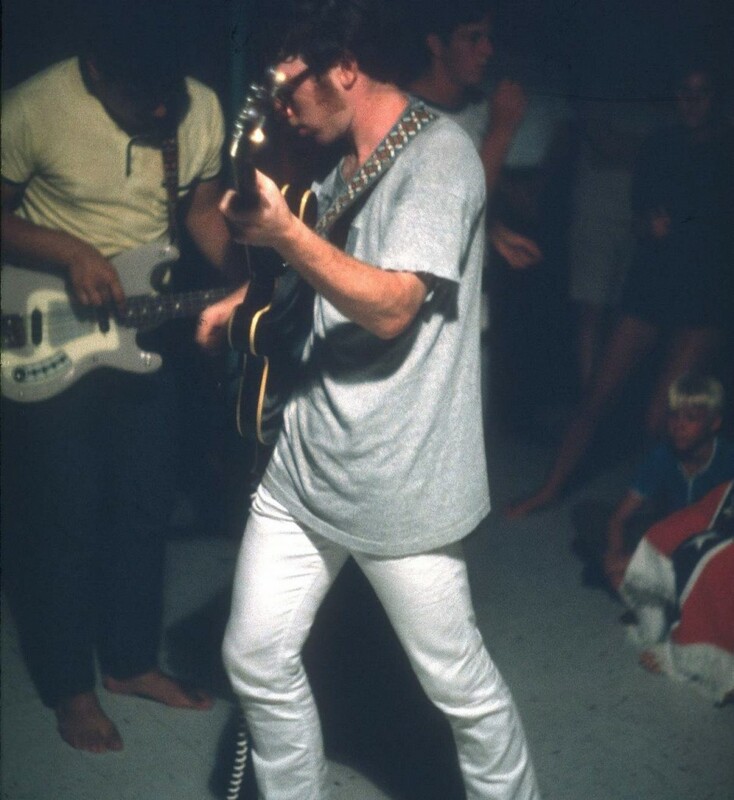 My after-school job paid for most (the balance a Christmas present) of my “66 ES 335, which I stupidly sold in in 1971ish and, miraculously got back (now THIS is a story)….. for free in 2012! Too bad I turned out to be 10 times better at saxophone—sure would have loved to see my half-Polish Dad make me a bari sax–God bless him–he passed n ’99. Trying to attach a pic, but for all I know its of my house or grandchildren. 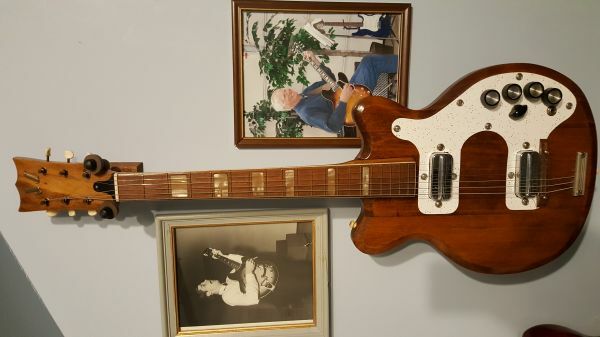 Sorry, me again, pic is sideways, but after two hours of trying, I take it.—Left off the coolest parts—pickguard/faceplates was left over from the bathroom countertops, and please note the brass “JD” logo on the headstock–a TRUE one-off.